Today, the school cafeteria had on its menu "Kanazawa sauce katsu curry," or Kanazawa-style Japanese curry with chicken cutlets. I noticed the chicken cutlets looked small so I got me a bowl of 3 pieces of karaage (Japanese-style fried breaded chicken bits/nuggets). Together with the spinach, this all cost me a whopping 640 yen and over 1200 calories. Pushed it all down with free drink-all-you-can tea as always. A "refreshing taste of summer," as Pepsi advertises. As we say in the Philippines, "lasang babolgam." Tastes like bubblegum. I think it's just the right taste for what it says it is (salt+watermelon+soda water), but definitely not at all exactly the same as fresh watermelon with salt. And I can definitely imagine some people not liking this because they don't like stuff like this, i.e. they expected it to probably taste exactly like fresh watermelon with salt. As for me, I'm not getting one again only because I like cola (Coke or Pepsi) better, and meanwhile this is just as (in)expensive. Just glad to have this on my "been there, done that" list. This one is expensive at 348 yen, from 3F. But it's packed. There's pork (maybe ham or bacon) bits, broccoli, carrots, those curly noodles, pumpkin, string beans, and soy beans ("edamame") all in an oily tomato-based soup. I don't know where the oiliness comes from but I'm hoping it's olive oil. This is definitely not Japanese. More specifically the Japan! Japan! blog is now listed as one of the "Green Belt" blogs under the "Foreigners in Japan" category. As of today, I am currently a featured "new" blog on the Japan Blog Directory (JBD). If you have a blog about Japan, too, you can register your blog to their listing as well. "Black Belt" blogs are the veterans that have been established for a while now and are also recognized as top blogs by other bloggers and the media. "Green Belt" blogs are the challengers who have blogged for more than a year but have not yet received the public recognition to become a black belt. And finally, whereas some blogs are only maintained for a year and then abandoned, "White Belt" blogs are blogs that have not yet seen their first anniversary and therefore still have to show that they will last. Visitors to the Japan Blog Directory are encouraged to visit these "White Belt" blogs and give advice where necessary. After a year of existence, the white belts graduate to green belts. All that said, JBD is a great place for reading about Japan from the perspectives of foreigners living in Japan, foreigners outside of Japan, Japanese in Japan, Japanese outside of Japan, blogs about Nihongo, travel and food blogs, and many more. If I were to add to my "Welcome to Japan" 2-part article series, this should be one of the top sites to check out. Visit JBD today! If you're Filipino, you know how that chant goes, and what we do while chanting it. Yup, in English, it's actually called the Rock-Paper-Scissors (RPS) game. Oops, this should be upside down. 398 yen from Lawson. Karaage is Japanese-style fried breaded chicken balls/bits, as opposed to the Chicken Katsu, which is flat and uses something more closer to tempura breading, or "Chicken Fry" which is more like KFC. Look at it as Japanese-style chicken nuggets, except it's not flat as well and the breading (made with a lot of eggs) is a little bit thicker. This bento is a simple one. Karaage, with mayo, rice with black sesame seed sprinkles, and yellow pickled radish. 460 yen from 3F. Yummy but quantity-wise, not enough. Three kinds of yakitori (barbequed chicken), the brown one, the white one, and the skin only. There's also some ground pork, shredded scrambled eggs, nori shreds on the fried(?) rice, and pickled ginger and some wasabi. Yummy, tasty, but not enough, quantity-wise. Not for 460 yen! Bento Series BreakTime #16: Weiner Bread! This one is 130 yen from 3F. As you can see, it's not a sandwich. Right? It does come with mustard and ketchup, though. A very similar one except in sandwich form is 20 yen more expensive, and that one they call "Mustard Weiner Dog." Bread, by the way, is "pan" in Japanese. I bought this and some bananas to complement my Jambalaya dinner. Have you guessed where Jambalaya comes from? Here's a clue to make you more confused: it's almost like a derivative of the Spanish paella. This one is just 346 yen! Far from being great, taste-wise, but in terms of bang for the buck, it is! There is just one piece of meat though. The one I got is a miso rahmen. I'll try other flavors and noodle types next time. 399 yen for "M-size" Keema Curry with Summer Vegetables (mostly potatoes, cucumber, and some red bell peppers) at the cafeteria. In Japanese, it's "Natsu no yasai kiima karee." I also ordered an 84 yen serving of assorted veggies on the side: eggplants, spinach, and radish-carrot-tofu shreds mix. As usual, curry is eaten here with a spoon. But I got a fork as well, anyway, which I can use for the veggies as well. The chopsticks are there for decoration. Pork barbeque. Yum. 498 yen? I didn't mind. This one is from 3F and it is quite a rare one. Comes with rice of course, and rolled scrambled egg, pickled plum, and lotus roots + carrots mini-side dish. Yum. Bento Series BreakTime #13: "Kougei Don"
It's practically summer vacation already for the students here so the "by-the-pound"/"buffet" cafeteria is now closed until classes resume in the fall term (September). So off to the old cafeteria where I had me this rice bowl ("donburi") dish called "Kougei Don." Kougei comes from the name of our school in Japanese, Toukyou Kougei Daigaku, which translates to Tokyo Polytechnic University. Kougei by itself actually means industrial arts. What Kougei Don actually is is "fuwa tamago katsu don," literally translating to "soft egg pork cutlet rice bowl." Served with some shreds of nori on top, I actually like this dish a lot. For my dose of "glow" food to complement the mostly "go" and "grow" of this donburi dish, I also got me some spinach on the side. The donburi is 399 yen for an "M-size" and 551 yen totally with the spinach. I washed it all down with the free, nomihoudai (drink-all-you-can) cold tea. Oh and by the way, if you're coming from the Philippines, all cold/iced teas here are natural - no sugars or other sweeteners included. "Special Hamburger Bento," only 398 yen from the supermarket. Quite cheap, right? It's one thick burger patty with demi-glaze sauce on a bedding of lettuce and Asian-style spaghetti (i.e. sweet, just like Filipino-style spag), microwaved egg?, a weiner, some pickled plum, and rice with some sesame seeds and another plum. That plum on the rice is placed there as it is believed to protect the rice. Not in photo (below the egg): vermicelli-carrot-garlic stalks side dish in light sour-sweet sauce. Yummy and filling. Chicken with chilis and onions on a bed of lettuce, with pickled radish and sesame-seed-sprinkled rice. It's a little spicy, and to me actually feels more like a Chinese than a Japanese dish. 498 yen from 3F. Oh and I bought some Dole bananas as well - imported from the Philippines - 5 for 168 yen, also at 3F. Something-Something Mayo Don. Sorry, I'm not familiar with the first two kanji on the label. It's basically a rice bowl dish topped with nori shreds and fried chicken with a sweet sesame-teriyaki sauce and mayonaise. Oh and there's some yellow pickled radish on the side too. 480 yen from Lawson. I really like the food at 3F better, price-wise, taste-wise, and in terms of the breadth of the selection. "Yokubari meat sauce," 450 yen from Lawson. Little expensive, spaghetti with meat sauce and a (pork) burger patty with, if I'm not mistaken, "demi" (demi-glaze) sauce. If it's spaghetti, they serve this actually with a fork. If it's curry or other non-East-Asian rice dish like taco rice, they serve it with a spoon. Most everything else here are served with chopsticks. This one I ate with chopsticks, which I put in the photo for scale. The picture says it all. 398 yen, and it's not exactly the typical pesto. I don't really know what kind of pasta recipe this is. And yep, bacon here is a little bit different; looks more like ham in color and texture and only bacon in shape, but still yummy nonetheless. And well here, in pasta dishes, they might call chilis like the Italians call them: peperoncino (pronounced pepperonchino). Did you know? The word "pepperoni" that we know from American English actually refers to some peppers (like red bell peppers) in Italian. The yummy pizza topping that we in the US and in the Philippines call "pepperoni" actually translates to something that means spicy sausage in Italian. And did you know? Here in Japan, green bell peppers are called piiman and red/orange/yellow bell peppers are called papurika (paprika). For dinner, I went to the "old" cafeteria, and got one of their regulars, a "Sasami Cheese Katsu," where "sasami" is basically a chicken part that's perfect for filleting. I also had salad bar where I got spinach, broccoli, corn, and egg, and my usual M-size rice, almond jelly dessert, and hot tea-all-you-can. All under 500 yen. For my "buffet" lunch, I picked up a ham, cheese, and asparagus "katsu," and two slices of roasted chicken, the usual lettuce bedding and cherry tomatoes, and for the katsu and lettuce, I have ketchup and mayo as dip. There's also a ball of mashed pumpkin salad in there, which is a little bit sweet and definitely yummy in a pumpkin sort of way. No pineapples this time around because there were none yet when we got there. A beach on Chigasaki, the nearest one to my place. Never been there yet and I probably won't ever be able to go. Last Monday was Marine Day here in Japan, a national holiday. This year, it was on July 16. I totally forgot about it this time, but now I know why one of my meetings were scheduled for July 17 (Tuesday) and not July 16. Literally, "Japanese curry rice with pork cutlets," this one is an L-size serving for 441 yen. The curry itself has the usual beef, potato, and carrot bits, and served with pickled radish. It's not so spicy so I sprinkled some crushed chilis on it. It became a little cooler tonight so I had me some free all-you-can-drink hot tea this time, but as usual I didn't miss out on the almond jelly with orange slices for dessert. Notice that I ate the curry with a spoon - this is the Japanese way of eating Japanese curry. No chopsticks, although technically this is easier to eat with chopsticks than Katsudon where the rice becomes soggy because of the "egg sauce." In the same way, I always make it a point to eat Japanese or Chinese food with chopsticks because I feel like they taste better when eaten with chopsticks. But did you know? The standard Korean way of eating rice is with a spoon. Everything else are with Korean-style chopsticks. Oh and Japanese chopsticks are pointier and Korean ones are flatter than Chinese chopsticks. In the Philippines, I think most chopsticks there are Chinese-style, even ones in many Japanese restaurants. I've blogged about the "new" cafeteria in school where they serve food "buffet" style. It is eat all you can, but it's not a "buffet" in the original sense of the word because you pay as much as you eat as opposed to paying a fixed price. I've also referred to this as the "by-the-pound" ( or "by the kilo") cafteria. If I'm not mistaken, it's 1 yen for every 0.5 grams (0.001 lbs), or maybe the other way around. The plain, steamed rice has a different unit price though. I was too early to get one of my faves, roasted chicken, so I settled for this plate of white fish fillet, a couple of shuumai, half a boiled egg, and my usual lettuce bedding, tomatoes, and pineapples for dessert. I was a bit generous with the mayo as you can see. It is Japanese-style mayo, which is kind of tasty and a little bit sweet. I did find a new use for this mayo - as a dip for the pineapples. Yummy. I was also a little generous with the rice, and this cost me around 550 yen in total. As always, the tea is free and it's free to refill any number of times. I should add that my Mainland-Chinese colleagues here call the shuumai as "Japanese-style," because up there they have bigger ones that are packed with some rice as well that make them full meals by themselves, maybe usually for breakfast, or as a really heavy snack or a quick hunger-stopper. Of course, to us in Southeast Asia and maybe even in HK, this certainly looks like a typical Chinese shuumai and not "Japanese-style," but it is maybe more like Southern China style as opposed to the bigger ones being Northern China style. Taste-wise, to me, it's just about right for something that's not served at a fancy authenthic Chinese restaurant. If these were sold in the Philippines, they would probably be 40 to 60 pesos for four - it's that much better than the street/kiosk shomai we get for 30 pesos or less. Bento Series Breaktime #8: "Mara Chicken"
"Mara," pronounced "Maaraa," is actually Chinese for hot and spicy. This "Mara Chicken" dish literally translates to "chicken with Chinese hot and spicy sauce." It's actually quite good together with the veggies (beansprouts and some greens). With M-size rice and drink-all-you-can tea, this is all only for 398 yen at the cafeteria. Here, men with fans is commonplace. Image from House of Japan. 36 degrees Celsius (97 degrees Fahrenheit). That already says it all. It's a holiday today so no cafeteria for me. For lunch I ate something I've already blogged about before. But this time, I also ordered salad. Just got the cheapest one, "Fresh Salad," only 158 yen from 3F. It's mostly cabbage and onions, but with the sweet vinegary dressing (vinaigrette? ), it's great with my main bento meal. It's supposedly a Ginger & Pork Plate, but it's more like Onion & Pork. Tasted great though. 399 yen. 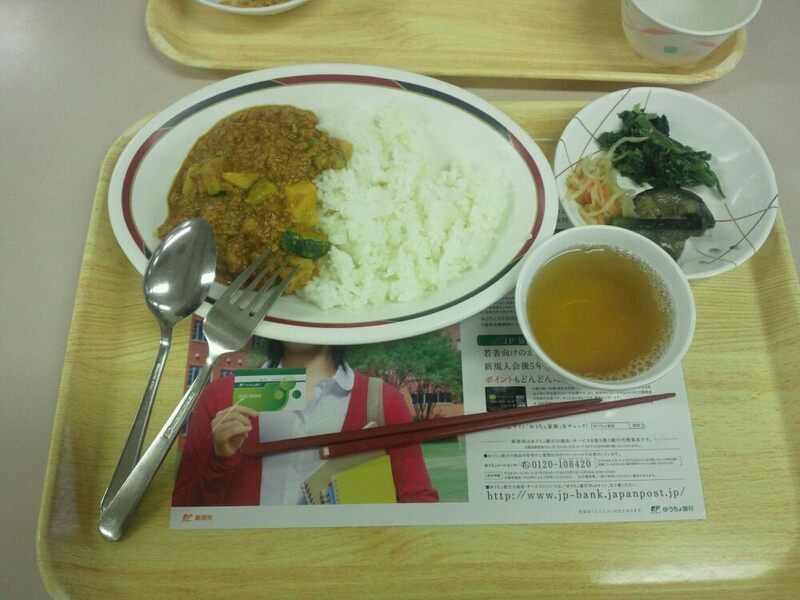 Together with M-size rice and almond jelly dessert, and drink-all-you-can tea, the meal totalled around 580 yen. I bought rice with (roasted?) chicken that came with a salty-vinegary sauce, orangle pickled radish (that almost looks like carrots), some seaweed(?) on the rice, some spaghetti or soba maybe below the chicken, and some onions again on the chicken. 398 yen from 3F, and almost like a small version of one I blogged about earlier. I bought it then with this salad with chicken and egg and has a miso/sesame dressing. Quite nice. 280 yen though; expensive. But I imagine some people would have this alone for a meal. Oh and veggies here are generally expensive, with comparable prices to meat. Kanji for "Filipino" and "Catholic"
Taco Rice with egg. 480yen from 3F. Expensive but yummy. Mmm, egg. And corn. And yup, they serve this with a spoon, not chopsticks. Today's special at the school cafeteria: Mixed Grill. 399 yen. 504 yen with size M rice. (Pork) burger, roast chicken, and minced beef (but mostly potato) katsu, plus fries, spinach and corn sides. This was served to me smoking hot. Unfortunately, all the steam was gone when I took this picture. But I think it's worth the price. Chuukadon, 398 yen. Rice bowl with carrots, mushrooms, veggies, quail egg, shrimp, and scallops topping. Sound familiar? It's actually Chop Suey. Yes, the Chinese-in-origin dish, "Japanese style." Comes with pink ginger garnish. Usually, ready-to-eat food at the supermarket are cheaper than at konbinis, and maybe this is true for chuukadon. But 398 for this much felt too much. After I watched the documentary "Super Size Me" years ago, I craved for McDonald's food immediately, contrary to what the documentary preached. Recently, I was in a discussion about sushi with someone and why I should cut down on eating certain types of fish. And that made me want to eat sushi again. I realized that it has probably been over half a year already when I last ate sushi. So I thought, why not. Saw this set at the supermarket and had it for dinner. It's 498 yen but here it's a good deal. This has tamago (egg) sushi, maguro (tuna) sushi, sake/shake (salmon) sushi, two ama ebi (sweet shrimp) sushi, ika (squid) sushi, anago (sea eel) sushi, and three other items I'm not sure what they are. One might be hotate (scallop) sushi. Comes with pickled ginger garnish and light soy sauce as usual. I ordered Katsudon at a food court here in Japan, which is rare. I had to wait for it first though, so they gave me this beeping, light-emitting, vibrating order claim number. The katsudon itself is 580 yen but pretty good. It came with pickled radish which was nice. Notice also the eggs. There's probably two in there. When I first ordered this here 7 years ago, I wondered what kind of sauce they put and why they put it because it made using the chopsticks on the rice difficult. I realized that what they actually put as "sauce" is raw egg, white and yolk. The egg then cooks a bit on the hot rice and katsudon. They do this also for gyuudon. The Japanese like raw eggs and maybe raw food in general. You guys all know about sushi and sashimi - but for the past more than two years I've also tried beef sashimi and horse sashimi here. Pretty good, but those two as well as raw eggs aren't things I'd try outside of Japan. I just feel it's generally safer here to eat raw stuff. I must warn you though that last year, some died after eating raw beef at one restaurant because apparently, that one time, they didn't clean the raw beef meat properly. You might think tempura is something purely Japanese. It does have kanji: 天麩羅. The first character means heaven, the second is bran / wheat bran / mash, the last character means from. So tempura would literally translate to "bran/wheat bran/mash from heaven." temperar, a verb meaning "to season." Actually, there is still today a dish in Portugal very similar to tempura called peixinhos da horta, that literally translates to "garden fishies." Tempura was introduced to Japan in the mid-sixteenth century by Portuguese Jesuits, during the same period that panko and such dishes as tonkatsu were also introduced from Portugal. It is also possible that the Portuguese picked the technique up from Goa which was their colony in India and this could very well be a variation of the "pakora." Is tempura then not Japanese food? It is. In the same way that ramen (Chinese in origin; i.e. lo mien) and gyoza (Chinese in origin; i.e. jiaozi) particularly those you eat here in Japan are very distinctly Japanese, different from the Chinese versions of those foods, and that lumpiang shanghai (Chinese in origin; i.e. chunjuan or lunpia) and pancit canton (Chinese in origin; i.e. chow mien, chaomian) are distinctly Filipino, different from the Chinese versions of those foods. In the same way that American English is still English, though distinctly American and very different from their British origins. Simple, seasonal bento from 3F (498 yen): Fried chicken fillet with spring onion and mayonnaise (made from eggs!) topping, pickled radish siding, rice with black sesame seed sprinkles. Nice! But actually I had some extra rice to supplement the rice here. The chicken was a rather huge portion. 398 yen, from Lawson: roasted chicken, half a burger, ebi fry, potato katsu, macaroni salad, egg omelette with ketchup, a bedding of spaghetti, and rice topped with.. parsley? Not so great, overall.